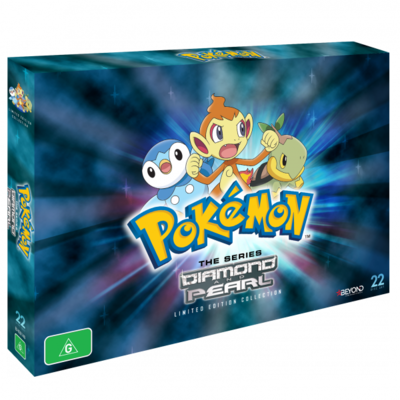 Description INCLUDES ALL 189 EPISODES FROM POKEMON THE SERIES: DIAMOND AND PEARL. 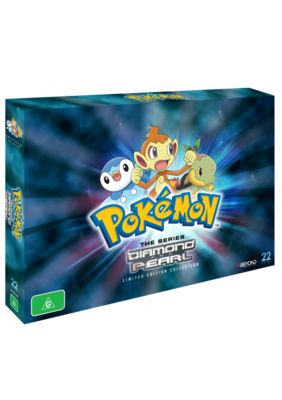 There's no place like Sinnoh, the next stop on Ash Ketchum's quest to become a Pokémon Master! Legendary powers maintain a delicate balance in the Sinnoh region, a modern land where ancient statues and ruins still speak of the mighty Pokémon Dialga and Palkia one said to be the ruler of time, the other of space. For Ash, there's no time to waste as he battles his way through Sinnoh, joined by his old buddy Brock and new friend Dawn, an aspiring Pokémon Coordinator. What new Pokémon will they meet, and which ones will they catch? These young Trainers can't wait to find out! Whether its solar-powered Sunyshore City or frosty Snowpoint City, there's no place Ash won't go in order to challenge Sinnoh's Pokémon Gyms and earn a spot in the Sinnoh League tournament. Ash and his friends are as determined as they come, but this time they'll face rivals and foes who never let up. Ash's new rival Paul does whatever it takes to win, no matter the cost to his Pokémon. The ruthless poacher, Pokémon Hunter J, stops at nothing when it comes to kidnapping Pokémon for cash. Even worse, the relentless forces of Team Galactic have launched a plot to destroy all of Sinnoh and the Pokémon world! Ash's Sinnoh adventure could prove to be his most epic challenge yet! Eipam and Buizel! Respective Roads!! Gliscor and Gligar! Getting Through the Maze of Wind! Pikachu! Raichu! The Way to Evolution!! Restaurant Seven Stars! Tag Battle for a Full Course!! Thief That Keeps on Thievingヤンヤンマ！ゲット作戦!!Yanyanma! Operation: Get It!! Gureggru Festival of the Nomose Great Marsh!? Nomose Gym! VS Maximum Mask!! The Gluttonous Urimoo at Urayama's House! Research Presentation 'Legend of the Lake'! The Final Contest! Pokémon Triathalon!! Back to Basics for the Rocket Gang!? Dancing Gym Leader! Melissa Appears! Pachirisu's Fever! Care-taking by 2 People!? Elite Four Ryō! Forest of Meeting and Separation! Shield with a Twistヨスガジム戦!VSメリッサ! !Yosuga Gym Match! VS Melissa!! How to make friends with Pokémon!? Wild Junsa and her Partner Perap! The Lonely Snoverさびしがりやのユキカブリ！The Lonely Yukikaburi! Stopped in the Name of Love進化！その時ポッチャマは!?Evolution! But Then Pochama...?! Old Rivals, New Tricksポケモンコンテスト・タツナミ大会！！Pokémon Contest - Tatsunami Tournament!! To Thine Own Pokemon Be True!ポケモンピンポン大会！エテボースがんばる! !Pokémon Ping Pong Tournament! Eteboth Gives Its All!! Battling a Cute Dramaチェリンボ！けなげなバトル!?Cherinbo! A Brave Battle!? Classroom Trainingトレーナースクールのスズナ先生!Teacher Suzuna of the Trainers' School! Sliding into Seventhキッサキジム！ 氷のバトル！！Kissaki Gym! Ice Battle!! A Pyramiding Rageバトルピラミッド!シンジvsジンダイ！！Battle Pyramid! Shinji VS Jindai!! Pillars of Friendship復活のレジギガス!J再び! !The Revived Regigigas! J Returns!! Frozen on Their Tracksデンリュウ列車！ハンサム登場！！The Denryu Train! Handsome Appears!! Promoting Healthy Tangrowth森の王者！モジャンボ！！The Forest King! Mojumbo!! Beating The Bustle & Hustle!全員参戦！ポケモンハッスル！Everyone Joins the Battle! Pokémon Hustle! Gateway to Ruinテンガン山の遺跡！ギンガ団の陰謀！！The Ruins at Mt. Tengan! The Galaxy Gang Conspiracy!! Three Sides to Every Storyマリル・ポッチャマ・エレキッド！Maril - Pochama - Elekid! Strategy Begins At HomeヒカリVSママ！親子対決! !Hikari VS Mama! Showdown Between Parent and Child!! A Faux Oak Finish!オーキド博士を救出せよ! ニョロトノVSグレッグル！！Rescue Professor Okido! Nyorotono VS Gureggru!! Historical Mystery Tourネイティ, ネイティオ。。。不思議な森！Naty, Natio... Mysterious Forest! Challenging A Towering Figure!タワータイクーン! その男, クロツグ！！Tower Tycoon! That Man, Kurotsugu!! Where No Togepi Has Gone Before!史上最悪のトゲピー！The Most Horrible Togepi of All Time! An Egg Scramble!ジョウトフェスタ！ チコリータとワニノコ登場！！Jouto Festa! Chicorita and Waninoko Appear!! Gone With the Windworks!ダンジョン攻略!? 谷間の発電所！Dungeon Escape!? The Valley Power Plant! A Rivalry to Gible On!フカマル…ゲットだぜ！I got... Fukamaru! Dressed for Jess Success!ポケモンコンテスト！ スイレン大会！！Pokémon Contest! Suiren Tournament!! Bagged Then Tagged!サトシとヒカリ!タッグバトル! !Satoshi and Hikari! Tag Battle!! Try for the Family Stone!ムウマとヤミカラスとやみのいし!Muma and Yamikarasu and the Dark Stone! A Marathon Rivalry!燃えよカビゴン！ポケスロンの王者！！Get Fired Up, Kabigon! The King of Pokéthlon!! Sticking With Who You Knowピカチュウポッチャマくっつかないで！！Pikachu, Pochama, Keep Apart!! Unlocking the Red Chain of Events!赤い鎖！ギンガ団始動！！The Red Chain! Activated by Galaxy Gang!! The Battle Finale of Legend!ディアルガとパルキア! 最後の戦い！！Dialga and Palkia! The Final Battle!! The Treasure is All Mine!危険がいっぱい！コジロウの宝箱！！Full of Danger! Kojiro's Treasure Chest!! Mastering Current Events!エアバトルマスター登場！グライオンVSハッサム！！The Air Battle Master Appears! Glion VS Hassam!! Double-Time Battle Training!ダブルバトル！マンムーとヒノアラシ！！Double Battle! Manmoo and Hinoarashi!! Meteoric Rise to Excellence!フカマルとりゅうせいぐん！！Fukamaru and Draco Meteor!! Gotta Get a Gible!フカマル！ ゲットだぜ！！Fukamaru! Get it!! Regaining the Home Advantage!爆走！ジバコイルVSメタグロス！！Roaring Around! Jibacoil VS Metagross!! Short and To the Punch唸れ れいとうパンチ！ブイゼルVSバリヤード！！Roar, Ice Punch! Buoysel VS Barrierd!! Yes, in Dee Dee It's Dawn!開幕！ポケモンコンテスト・アサツキ大会！！Opening! Pokémon Contest・Asatsuki Tournament!! Playing the Performance Encore!ダブルバトル！VSプラスル・マイナン! !Double Battle! VS Plusle・Minun!! Fighting Ire with Fire!爆進化！ゴウカザル！！Blast Evolution! Goukazaru!! Piplup, Up and Away!ポッチャマはぐれる！Pochama Runs Away! Flint Sparks the Fire!四天王オーバとジムリーダー・デンジ！Elite Four Oba and Gym Leader Denji! The Fleeing Tower of Sunyshore!発進！ナギサタワー！！Takeoff! Nagisa Tower!! Teaching the Student Teacher!海辺のポケモンスクール！The Pokémon School at the Beach! Keeping in Top Forme!飛べシェイミ！空の彼方へ！！Fly Shaymin! Beyond the Sky!! Pokémon Ranger: Heatran Rescue!ポケモンレンジャー！ ヒードラン救出作戦！！Pokémon Ranger! Heatran Rescue Mission!! An Elite Coverup!四天王キクノ！カバルドンＶＳドダイトス！！Elite Four Kikuno! Kabarudon VS Dodaitose!! Dawn of a Royal Day!トゲキッス舞う！王女さまのポケモンコンテスト！！Togekiss Dances! The Princess' Pokémon Contest!! With the Easiest of Grace!トゲキッス! 華麗なるバトル!!Togekiss! A Battle of Splendor!! Dealing With a Fierce Double Ditto Drama!メタモン・へんしんバトル！本物はドッチ～ニョ! ?Metamon Transform Battle! Which One~ is it that's Real!? Last Call, First Round!グランドフェスティバル開幕! 炎と氷のアート！！The Grand Festival Begins! The Art of Flame and Ice!! Opposites Interact!マンムー、バチリス！決めろ氷のシャンデリア！！Manmoo, Pachirisu! Finish it with Ice Chandelier!! Coming Full — Festival Circle!セミファイナル！決勝へ進むのは！？Semi-Finals! Who will Advance to the Finals!? A Grand Fight for Winning!決着ライバル対決！ヒカリＶＳノゾミ！！Concluding Rival Battle! Hikari VS Nozomi!! For the Love of Meowth!さよならロケット団！ニャースの恋! ?Farewell, Rocket Gang! Nyarth's Love!? The Eighth Wonder of the Sinnoh World!電撃バトル！最後のバッジ！！Electric Shock Battle! The Final Badge!! Four Roads Diverged in a Pokémon Portサトシvsケンゴ！それぞれの船出！Satoshi VS Kengo! Setting Sail for Respective Destinations!! Bucking the Treasure Trend!トレジャーハンター・バクとヤジロン！Treasure Hunter Baku and Yajiron! An Old Family Blend!熱戦前夜！サトシのポケモン大集合！！The Night before the Fierce Fight! The Great Assembly of Satoshi's Pokémon!! League Unleashed!開幕！ シンオウリーグ・スズラン大会!!Begin! The Sinnoh League Suzuran Tournament!! Casting a Paul on Barry!シンオウリーグ三回戦！シンジ対ジュン! !The Third Fighting Round of the Sinnoh League! Shinji VS Jun!! Working on a Right Move!恐怖のトリックルーム！サトシ対コウヘイ！！The Trick Room of Terror! Satoshi VS Kohei!! Familiarity Breeds Strategy!ライバル決戦！サトシ対シンジ！！Decisive Rival Match! Satoshi vs Shinji!! A Real Rival Rouser!激闘フルバトル！サトシ対シンジ！！Fierce Full Battle! Satoshi VS Shinji!! Battling a Thaw in Relations!決着ライバルバトル！サトシ対シンジ！！Rival Battle Conclusion! Satoshi VS Shinji!! The Semi-Final Frontier!シンオウリーグ準決勝！ダークライ登場！！Sinnoh League Semifinal! Darkrai Appears!! The Brockster Is In!ポケモンドクター・タケシ!Pokémon Doctor Takeshi! Memories Are Made of Bliss!思い出はパール！友情はダイヤモンド！！Memories are Pearls! Friendships are Diamonds! !